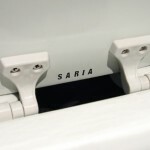 Saria Toilet Seat and Covers | LION Automotive Car Care Products – SARIA International, Inc. This exceptionally durable solid high impact plastic seat has a stylish, highly stain resistant modern design and an attractive sculptured cover. It’s distinctive features provide for easy cleaning and for quick simple installation with a conventional screwdriver. Injection molded of a high impact solid plastic. Highly stain and chemical resistant for durability and easy cleaning. Factory-installed top mount Sta-Tite™ hinge. Improved corrosion proof nylon nuts and bolts. Integrally molded, permanent, color matched bumpers that never need replacing. 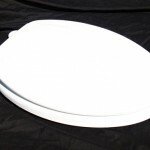 Accented, modern cover design features finger lift for convenient, sanitary handling. Adjustable Sta-Tite™ hinge for side to side adjustment. Allows for fit to bowls with 4.625” to 6.375” on center.